Michigan has a long history of Amish settlement, with the first Amish settling in the Great Lakes State in 1895. Today Michigan’s Amish population numbers approximately 11,000. Michigan’s 86 Amish church districts are scattered over 35 settlements, from Hillsdale and Branch Counties in the south, to Mackinac County in the Upper Peninsula. The Amish community at Centreville in St. Joseph County (founded 1910) is the oldest and largest in Michigan. Consisting of 11 church districts (roughly 1,500 individuals), this settlement has been in existence 100 years. The Centreville Amish community was founded by families from the Swiss Amish communities in Adams and Allen counties in Indiana. The Swiss Amish, an Old Order ethnic subgroup, are distinct from Pennsylvania German-ethnicity Amish. Swiss Amish speak a different German dialect, are typically more conservative when it comes to technology, and tend to marry only within Swiss circles. Many Swiss Amish also practice yodeling, permit only open-top carriages, and mark graves with wooden stakes rather than gravestones. Later, these Swiss settlers to Centreville were joined by PA German-ethnicity Amish from Lagrange County to the south. Today’s community is comprised of descendants from these two distinct Amish ethnic groups. Today, Centreville has ties with the much larger Amish settlement at Lagrange and Elkhart Counties, just south of the border in Indiana. Churches in the two communities are in fellowship with one another. Amishmen from the Centreville community travel daily to work in the region’s RV factories, returning home to Michigan at the end of their shifts. With increasing ties to the world has also come increasing technological change. Karen Johnson-Weiner notes this change in Train Up a Child: Old Order Amish and Mennonite Schools. Amish in the Centreville community have accepted phones to a greater degree, allowing them in phone booths and in some businesses. Additionally, bicycles have been allowed in some church districts, as well as rubber tires on large wagons. Johnson-Weiner notes further ties in education between the two communities, with female teachers from Centreville teaching and living in the Elkhart/Lagrange settlement, and returning home for the weekend. Centreville Amish, in addition to working in the RV factories to the south, contribute to Michigan’s economy as well. Some Centerville Amish operate dairy farms. Others run small businesses such as furniture, fabric, and vinyl shops (read more about Michigan Amish furniture businesses). As the largest Amish settlement in Michigan, Centreville also has a modest tourist industry. Branch County is home to 5 distinct Amish settlements, making it one of the most heavily-settled parts of Michigan. Amish communities can be found at Quincy (1977, 6 districts), Bronson (1971, 1 district), Reading/Hillsdale (1979, 2 districts), Coldwater/Kinderhook (2004, 1 district), and in California Township (1960, 5 districts). One of the settlements, that of Quincy, is a Swiss Amish settlement, founded by Amish from Norfolk, New York (with roots in the large Swiss Amish community in Allen County, Indiana). Quincy is at present the second-largest Amish settlement in Michigan, and with 6 church districts has an Amish population of roughly 800. Another of the Branch County communities, that of Reading/Hillsdale, in fact takes in part of neighboring Hillsdale County as well. Hillsdale for its part has an additional two Amish communities, at Osseo and Pittsford (1997, 2 districts), and the Swiss-roots settlement at Camden (1956, 4 districts). One of the older Michigan Amish settlements is found at Mio in Oscoda County. This community of 3 church districts was founded in 1970. However, Amish had previously lived at Mio for over half a century. The original Amish community at Mio was founded in 1900 by Amish from Geauga County, Ohio. These pioneer farmers to the region settled on land formerly covered by thick forests. Amish historian David Luthy notes that local land agents attracted both Old Order Amish and more progressive Amish-Mennonites to the region through advertisements in the widely-read Sugarcreek Budget newspaper. Luthy states that their efforts met with great success: “Few, if any settlements grew as rapidly as did the one in Oscoda County” (Settlements that Failed, Luthy, p184). Mio did in fact grow quickly, with over fifty Old Order Amish families arriving in the first five years, attracted by the inexpensive, unimproved land. To begin farming in this region, farmers had to clear their acres of the many stumps that remained from logging. But those that did were rewarded, and the inexpensive land prices ($2-5/acre) tempted many to migrate to this heretofore little-settled area of north-central Michigan. 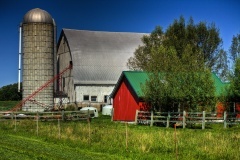 As Mio is located in the upper latitudes of Michigan, the settlement’s farmers dealt with a shorter growing season. However, Amish settlers saw positives in the extreme winters, Luthy reports. The Mio Amish “preferred this to the constant thawing as was the case in more southern parts of the state. They felt their winter was healthier and nicer, and they enjoyed using a sleigh instead of a buggy” (Settlements that Failed, Luthy, p185). Mio Amish farmers prospered, enjoying bumper crops on the formerly wooded Oscoda County land. Amish raised clover, hay, peas, corn, potatoes, buckwheat, and other crops. Eventually, the Old Order community began to go into decline. Part of the reason was that Old Order church members began joining the more progressive Amish-Mennonite congregation which had originally accompanied them to the region. As the competing Mennonite church grew, Old Order Amish moved away or adopted more technological innovations, such as tractors. The Mio community went extinct as an Old Order Amish settlement with the death of the last remaining bishop in 1954. Sixteen years later, a new group of Amish would settle here, founding what is today Michigan’s fourth-oldest Amish community. These settlers, coincidentally, also came from Geauga County, Ohio, and later included Amish from northern Indiana. The present-day Mio community has seen nothing like the growth of the original one, however, with a population of just 400 individuals after 40 years of existence. Since 2008, an Amish settlement has existed in Mackinac County in the Upper Peninsula. This is the only Amish settlement located in the UP. Previously, however, an Amish settlement did exist in the Upper Peninsula, at Newberry in Luce County. This was a very short-lived settlement, lasting only three years (1897-1900). David Luthy, in The Amish in America: Settlements that Failed 1840-1960 gives the history of this settlement. Amish settlers from Ohio founded this settlement in the waning years of the 19th century. 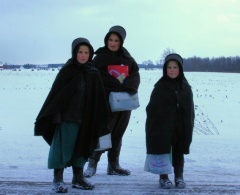 One challenge Amish settlers encountered was the particularly harsh northern Michigan climate. Luthy cites a letter from an early Amish settler who “mentioned that they hadn’t seen any ground since November 22nd and that presently in April there were eighteen inches of snow yet covering the ground” (Settlements that Failed, Luthy, p182). As a common reason for Amish migration is suitable farmland, harsher climates such as that found in the Upper Peninsula can particularly challenge unestablished, fledgling Amish settlements. The letter-writer also noted that the growing season was significantly shorter than that in Ohio. A total of six Amish families settled this rugged area, with the last settler eventually moving to the new settlement at Mio in southern Michigan’s Oscoda County in 1900. The present-day Mackinac County settlement is located near the village of Engadine. These modern-day Amish settlers no doubt face similar climate challenges as did the Luce County group. Consisting of a single district, it is one of the newest settlements in Michigan, and time will tell if it will thrive or fail. For various reasons, Michigan has been a state that has attracted Amish settlement. At the same time, numerous Amish settlements in Michigan have gone extinct. Despite its significant Amish population today, Michigan ranks as the state with the highest number of extinct Amish settlements, with at least 14 in its history. In addition to the extinct settlements at Mio and Luce County in the Upper Peninsula, Amish settlements have arisen only to later disappear at Spruce in Alpena County (1905-1922); White Cloud in Newaygo County (1895-1935); West Branch in Ogemaw County (1908-1942); and Hope in Midland County (1909-1930). Michigan Amish settlements have failed in recent years as well, with at least 4 going extinct since 2000, including at Hale in Iosco County (1978-2007; a separate Amish settlement was founded here in 2006); Elsie and Ovid in Shiawassee and Clinton Counties (1987-2004); Coral in Montcalm County (1991-2008); and Vestaburg in Montcalm County (1993-2006). Despite its history of failed settlements, Michigan remains a state with a significant Amish population. While not nearly as large as that of neighboring Indiana or Ohio, in 2010 Michigan’s Amish population was estimated at over 11,000. It is also a state that has attracted new Amish settlement, with a net gain of nearly a dozen new communities over the past 2 decades (see Young Center Amish Studies’ Amish Population Trends 1991-2010). 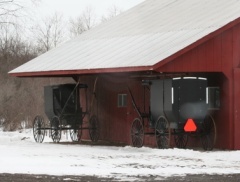 At the same time, for various reasons Michigan has seen a net loss of Amish households in recent years, according to the Young Center at Elizabethtown College. From 2005-2009, Michigan’s Amish population lost a net total of 45 households to other states. Besides the ones mentioned above, significant Amish communities can be found at Mecosta County (1982, 5 districts); Clare in Clare County (1981, 4 districts); Gladwin County (1979, 3 districts); Charlotte/Vermontville at Eaton County (1977, 3 districts); and Marlette/Brown City in Sanilac County (1987, 3 districts). Additionally, across Michigan one can find a large number of younger settlements founded in recent years, numbering anywhere from a few families to a few hundred individuals. 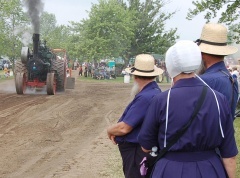 The Amish in Michigan have been covered on numerous occasions on the Amish America blog. In 2008 a reader shared a dozen photos of a Montcalm County, MI Amish settlement. 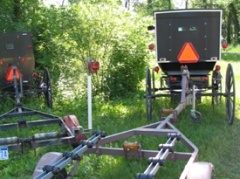 Each year a horse and carriage auction takes place, and is highly attended by the area’s Amish, at Mt. Pleasant, Michigan. A man raised Amish in Michigan discussed Amish life in one news piece. 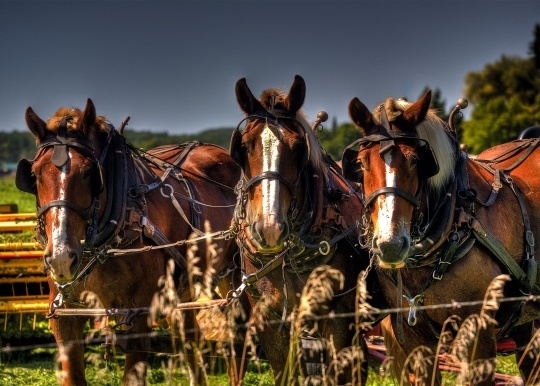 Michigan Amish Tourism and Business-Looking for a Michigan Amish business? A listing of Amish businesses and tourist information for visitors to the Michigan Amish communities mentioned above. Is anyone familiar with any amish business directories out there? I am familiar with the one in Lancaster county made by DavCo. I am wondering if there are others. If not, does anyone have any insight as to why that might be? Davco seems to make millions off of these ads, and I am surprised that that arent more like it. There is a large shop directory from Ohio every year in the Budget! Any Amish Roll Forming Company In Michigan. I have visited one in Gladwin and another in Sanilac County. There are actually a lot of Amish communities in Michigan….Ovid, Marion, Manton, Clare, and several others. Manton is only a 20 drive from my whom, where I buy many items ftom Pleasant Valley Market. Just returned from Fremont MI. It was unbelievable the amount of Amish that live within a 10 mile radius of the town. We stopped at 3 different grocery/bulk food stores, all Amish owned & operated. I am not sure on the number of districts but would guess at least 4 or 5. We also stopped at 2 different houses with bake goods for sale. The Amish community in Fremont seems to have grown a lot in the last10-15 years. I remember going to Troyer’s Footwear & Tack as a kid and there are many more Amish families near there than I remember as a kid. Wish I could become Amish! Interested in visiting and shopping at stores mentioned. The McDonald’s in Fremont is the only one I’ve seen with a hitching post for horse-drawn buggies. Which surprised me at first. I don’t suppose a Happy Meal would be appropriate for the kids, but there’s nothing particularly modern about buying a hamburger and fries with a coffee during a trip into town. Are there any opportunities to stay in an Amish community in Michigan? Even just stay nearby and interact with the people? I just wrote an article about the Amish for my university and I am just so interested and passionate about learning more. Morgan, we are open to your idea, but would like to make contact first. If you are still interested, call 231-743-9562. It is funny seeing you on here. What I find interesting about the Amish is that in most of the progressive to moderately progressive communities they are very conscious of what fire can do to their homes and families. There are a considerate amount of fires in Amish households or out buildings. They are not always treated fairly and can average 3 to 5 thousand dollars of product in their homes. I have been trying to stop this expensive proposition to them for years. I live in the largest group of Amish in Michigan were in Nottawa and Centreville area. I had an adopted amish grand parents from Nottawa. My neighbors are Amish. They seem to know about things that are very helpful to us all. you just get to know when and where to go for the best. Some great history here in st joseph county to learn and to ponder. We have them every where even in Leonidas and now headed trowards sturgis area also in Colon michigan and Burr Oak. so you see there is alot here. I did not see anything about the Amish in Marlette, MI There was a couple selling bakery items in Clio today, and she said they were from Marlette. Is this a fairly new settlement? Thank you. Looking to donate a Singer pedal sewing machine. Can anyone direct me to where to contact. I was born and raise in Fremont Michigan. The Amish here are really nice. In 2008, we had Amish neighbors. When we first moved in the wife and little ones brought us home made bread. The husband would mow our grass in exchange for rides to town. We have an old barn built in the 1930’s. It is two story and made from California redwoods I have been told. Can not afford upkeep, but don’t want to see it fall apart. Would anyone be interested in saving and moving it? We have a Very large community of Amish in Sanilac Co. MI All through Brown City & Marlette. The Amish now have 5 schools just in Brown City. They have many businesses in both cities. Please can you update your site to include these. Thanks Mary, yes we have Sanilac (Marlette and Brown City) listed already above. And we’ll be doing a general update of all these state guide pages soon. hi am looking for two childrens rocking chairs for my two year old granddaughters. I would much rather purchase from a small family business then a large furniture store that carries Amish and other large company furniture. I live in Arizona but the chairs would be needed in lansing/Grand Rapids area. Thank you for ant direction anyone can give me in purchasing a beautiful handcrafted rocking chair. Natural Log Home Products in Michigan has Bent Wood Hickory rockers with a twig or bark look, in a child size. They have a Michigan-made rocking chair with a solid seat, and an Ohio-made rocker. I understand that bent hickory rockers are not apt to be made in huge factories. On old 27 and Clare exit, the Amish used to sell goods on the side of the road. I noticed a sign was put up that says “no selling of goods in right of way (ROW) pa 510. I heard a Walmart is going in there. 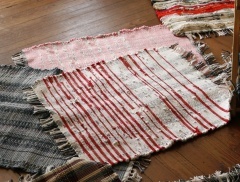 I googled ROW pa 510 thinking it was a county ordinance. Comes up a rule in Pennsylvania. I’m not exactly where to start so I figured I could just start asking everywhere. I am looking for my family on my biological fathers’ side. The only information I have is that they all changed their names, the last name is Byers and I know a few first names. My biological father’s name is Anthony Wayne Moore. Around 1990 my mom and him were looking for them and found that their mom had taken to Michigan and had become amish. I understand Amish people are private but I desperately want to meet my family. If anyone can help me figure out where to start looking to find them please let me know! Do you have full names and birthdates? Also it is helpful if you know area of birth and maybe parents name. I don’t have their birthdates but I do know they were about 7-12 years older than me, I’m 23. All of them were born in Meana, Arkansas except for one brother that was born in Hawaii, I don’t know which city 🙁 Their mother’s name was Nina Moore but she changed it to Nina Byers. Their father’s name (my biological father) is Anthony Wayne Moore I don’t think he ever changed his name. The birth names are: Anthony Kalani Moore (oldest), then Terrie Wayne Moore, Adam Wayne Moore, then Jacqueline Elizabeth Moore or Jacquelinelizabeth (something) Moore, she was the youngest until I was born. I deal with Amish in several states. I know of a couple of Bylers. Great to hear that Christine! Happy for you! Hi Muriel. You might try contacting Wayne Miller at the Amish & Mennonite Heritage Center in Berlin, Ohio. The Ohio Amish Library here has a lot of genealogy records and he MIGHT be able to help. He can be contacted at library@amheritagecenter.com. in fact Terry Wayne worked with me , and for some time nina and the others went to The Old Order Brethren church…. I do not know where she is at this point ,, but I know someone in Wakarusa Indiana who knows where she is…. We just moved to Manton, Mi and we have a good size community here. The community runs a metal shop, feed store, bulk food store, butcher shop, greenhouse, furniture, etc. I was told they settled here about 40+ years ago. I love what they provide to the community. Does anyone know where in Michigan I can find an Amish garden center/farm/market that sells vegetable seeds or plants? I am looking for someone who can construct a whole log (not just beam) a-frame cabin. I was told the Amish have extensive experience in log construction. Thanks in advance for any help. I purchased a small, six acre farm with a 116 year old house and an even older barn. I live in Milan Twp. I’m looking for barn repair or if its too far gone possibly a new build. I have 2 acres of lavendar and 1 mixed herbs for tea and a store front in town. I’m wondering if some of the Old Order might be interested in trading barn work for a safe travel stop; I.E. possibly building a mother in law apt attached to the barn for their use, a portion of my crop, or the ability to use my store front to sell their goods.We are close to Ann Arbor, Dundee, and Monroe. Does anyone know of any Amish within about an hour of Merrill, mi who will butcher our chickens for us? We prob have close to 50 right now that we are having a difficult time trying to get to. We both work full time and my husband has a second, part time job plus we have a rental house we are trying to get ready again. Cold weather is upon us and we need to have these chickens culled. If anyone has any contact info, that would be wonderful! I live in Alma, Mich and just purchased a farm that was built in 1898. The barn is in bad shape and I would like to have it restored. Is there any Amish people that do this type of work in or around my area that could give me a quote. I would much rather save it then tear it down. I am unable to find anyone that is willing to do this for me. Can anyone help point me in the right direction. Thank you. I have a house in Port Austin and along with Bad Axe, Caseville, and Port Austin, I can tell you. You CANT go one mile eatther direction And NOT spot a Buggy… I mean I have been driving the roads and thank God they have lights on the buggys now. I go to Port Austin Farmers Market. There must be 6t booths set up, selling bread, bake goods, one selling amazing cherry turnovers…And in Bad Axe they have a wood furniture store once you pass the GIANT WALMART on the right….if your heading on VanDyke… I would love to know more about where they are where they sell and of I could but something actually HAND MADE. I sometimes wish with our kids… Me???? BEING a generation X and my kids being melenials I grew up no computer no smart phones… I was told to GO PLAY…..ABD YES YOU MADE IT WORK! Just curious why no one comments on the puppy mills? Sad to say these people treat these dogs horribly yet don’t ever want to discuss it. Not the idyllic life that’s portrayed. Holly, you’re not seeing comments here on puppy mills, because this is not a post about puppy mills. This is a post about Amish in Michigan. This may not be the right place to pose the question, but we have 2 large, old barns that need to be taken down. Our property assessor suggested we contact the Amish community, as they are interested in this. Is this true? Interesting that it lists the Coral Amish community as extinct, because I was just there buying feed the other day from one of their feed mills. There is a large community in Coral and in Lakeview MI, has been as long as I’ve been alive. Definitely not extinct. They have a sawmill, steel mill, cheese house, feed store. I think there are actually two separate communities, Coral and Lakeview, but they are very close in proximity to each other. Zach, thanks for your comment, Coral is quite an interesting case. When I read what you wrote, I had a feeling of what might have happened, and looking further confirmed what I suspected – sometimes settlements go extinct and then the same area is resettled by a different group of Amish. However, Coral is noteworthy because settlements at that location have technically gone extinct not once but twice now, and been replaced each time by another settlement in rather quick succession. The JAPAS settlement listing explains this and has the listing of the current settlement which was founded in 2011 (unless there was a third extinction in the meantime and we are now on the fourth community… 🙂 ). The first settlement lasted it seems from 1991-2008, then another was founded which lasted from 2008-2011, followed by the current settlement in 2011. Since it seems there was little time between the extinction and founding of subsequent settlements (each time happening in the same calendar year), I can see how it might appear to be one continuous settlement. I don’t have information about the Amish who settled there, whether they were from the same or different affiliations, etc., but I’d be curious to learn more about the history of this Amish location in particular given that Amish seem to keep returning to the area. Thanks for you reply! That’s very interesting about the Amish Settlement in Coral. I asked around some, and there seems to be lots of information about that area. Someone told me there had been disagreements in the church and a split a while back, with most of the Amish leaving. My mom (who frequents the feed mill) actually told me recently that the owner there is moving out of state, but he’s already arranged for a family moving in to take it over. It’s interesting that the Amish community doesn’t seem to stay long there. I am not nearly as familiar with that community as I am with the Lakeview/Six Lakes, MI Amish. We would be invited over for dinners there quite often growing up. It definitely seems to be a more “stable” community. Sure, and thanks for this info as well Zach. Would be neat to hear the full story of this location/community. I checked some information concerning affiliations and wasn’t able to find who this group(s) may have been affiliated with. There are quite a few “reformist Amish”-related churches in Michigan and thought maybe there was a connection there. We’re looking for a reputable person or company who can handle most of the project details from start to finish, at a fair price. Does anyone have any referrals or know of a likely fit? Have you heard back from anyone? We are also interested in hiring someone to build a pole barn/garage. We live near Mio. Thanks! I own and operate a respected tour and experience company in Michigan. I am often hired for sensitive clients (special needs, foreign diplomats, and even some centenarians), so my customer service is focused on a top notch experience for my tour clients and my business partners. My customized experiences are based on being educational, understanding the subject better and connecting with it on a personal level. I would love to consider offering Amish related experiences to my tour guests. I work closely with my business partners (businesses I visit) to ensure it is a very positive experience for them. It’s important to me that any connection with my company is a benefit for whoever we visit. In other states, the Amish community is more open to the English, but my understanding is Michigan Amish prefer to stay more isolated. I would like some leads on Amish members of the community in Michigan who might be more open to this type of business arrangement. I know it would mean slowly gaining trust to get them comfortable with allowing me to bring people to them. Before I brought anyone to them, I would also want to have a solid understanding of how they prefer to handle things and make sure their customs and practices are respected. I work with other religions and communities to ensure they experience my tours as a benefit for them also. I also hope to benefit them financially. Please email me at info@DiscoveryMichigan.com with any questions or information. I would like to have a barn and animal shelters build on my property in Lapeer MI, can somebody contact with response or any informations, Thanks. would like to have a barn and animal shelters build on my property in Lapeer MI, can somebody contact with response or any informations, Thanks.